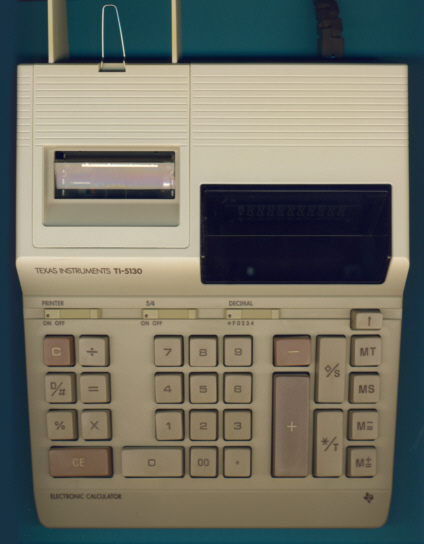 This "brown" TI-5130 is identical to the "office grey" TI-5130 introduced two years earlier. It matches perfectly its sibbling TI-5140 sporting a 12-digit display. Dismantling this TI-5130 manufactured in December 1985 reveals a design almost identical with the TI-5140. The main differences are the NEC uPD1234G single-chip calculator circuit and the 10-digit display compared to the uPD1231G chip driving a 12-digit display. Since we deciphered the product label of the TI-5310 matching the UL-File number E42662 with a identification code 694B, we know with Toshiba TEC Corp. the manufacturer of this calculator, too.